I moved from Atlanta, after 15 years, to live in Washington, D.C., for almost nine years. Upon my return, I discovered that Atlanta had become a city of glass. More skyscrapers than I could have imagined (mostly glass) were put up while I was away from home, including the entire mini-city of Atlantic Station. The glass facades make for some fun and interesting photography. 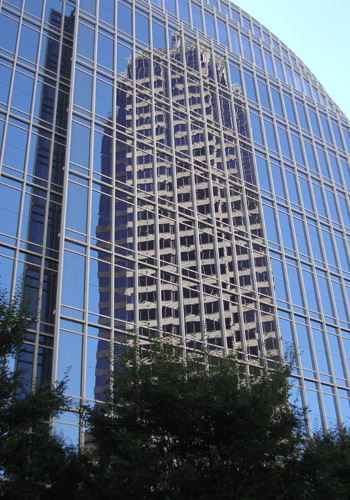 This photograph of 1180 Peachtree (Symphony Tower), a 41-story office building completed in 2006, shows a reflection of its neighbor, the Promenade II, a 38-story office building completed in 1990. Both are in Upper Midtown.